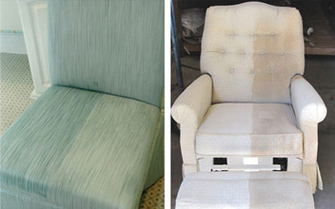 Your upholstery deserves the very best care! Store-bought cleaners can help, but occasionally your furniture needs a little TLC to give it new life and vitality. Ron’s can clean and deodorize your furniture without damaging it, regardless of what kind of fabric you have. From silk to leather, and everything in between, Ron’s has the expertise and equipment you need to get your furniture cleaning completed without damage and get it looking like new again. 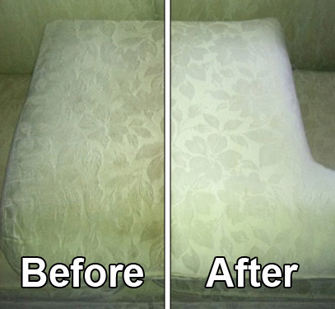 Let us show you why we are the premiere upholstery cleaning service in the industry! Give us a call today at (864) 297-6440 or contact us online to schedule service! The fabric is pre-sprayed with special cleaning compounds especially designed for your particular fabric & soil condition. This loosens up the soil to make rinsing more effective. Once the soil has been loosened, we will thoroughly flush the fabric with our specially designed upholstery extraction tools. This step sanitizes & deodorizes the fabric. Water pressure is regulated so that fabric is not over wet. Every piece that we clean is pH balanced so there is no sticky left behind. This treatment is applied as a rinse through the machine or is applied after rinsing depending on soil conditions. If any spots are not removed during the cleaning process, specialty-spotting techniques are applied. If upholstery has a knap, the knap is set in one direction using a grooming brush or white towel. Piece is inspected by the technician and then by the homeowner during our post inspection. The customer will let us know that they are pleased by signing our invoice. No matter what sort of fabric cleaning you need taken care of, Ron’s has the equipment and experience to handle all curtain, ottoman, and sofa cleanings.